(March 2016) I awoke at 6:30am in the large four-poster bed on the top floor of the Hotel Mere castle. A faint light was beckoning beyond the long curtains and I knew dawn was rising over the Caucasus Mountains. Jumping out of bed, I pulled back all of the drapes that covered the floor to ceiling windows, then threw open the doors to step out on the balcony that ran around three sides of my tower room. Then I caught my breath in wonder! The view of the long range of snow-capped Caucasus Mountains was magnificent, with the rosy fingered dawn caressing the tops of the peaks. Over the next hour, I sat perched on my sofa drinking a cup of coffee and watching the light play over the face of the mountains. The colors changed from a dusky purple to a pale peach and pink, and then took on the full glow of the sun to dazzle and dance off the blazing white snow. The contrast of the blue sky and the green Kakheti Valley below filled with vineyards made it even more breathtaking. I knew I was experiencing one of the highlights of my life in that view. Grabbing my camera, I took some photos as well as a video (see above). Then threw on some clothes and took a walk through the property and down to the main road so I could see the complete view. After a delicious breakfast, we left Hotel Mere around 9am and drove thirty minutes to Tsinandali Palace. Built in 1835 by poet, Alexander Chavchavadze, it is a beautiful Italian style palace with graceful arches and white iron filigree. The large gardens that surround the palace are beautiful and peaceful to walk in. Tsinandali was not only a center for music and culture in the 1800’s, but also the site of a historic winery and cellars. A special white wine was made there, and the family collected wines from around the world. We were invited to tour the historic cellars, which like many of the old properties in Georgia, are currently being renovated. We were impressed with some of the old bottles in residence, including Chateau d'Yquem, but were told that it is suspected that most are not drinkable anymore. After the tour, we were escorted into a nearby building where we enjoyed a masterclass and tasting of old saperavi wines. This was led by famous winemaker, David Maisuradze. He was fascinating to listen to, and showed us an interesting chart of how wine production in Georgia had fluctuated during the Soviet era. We were impressed with many of the wines, and realized that saperavi, with its huge tannins and high acid, has a good aging potential. After the tasting, David escorted us on a tour of the vineyards. The day was beautiful, with blue skies, fluffy white clouds, and a bright sun. It was delightful to be in the still barren vineyards with the breadth of the Caucasus Mountains serving as an amazing backdrop. Again, we were told how lucky we were to see the mountains, because they are often covered by clouds. After the vineyard tour, we had a delightful buffet style lunch and enjoyed trying “chacha.” This is not only the name for the grape skins, seeds, and stems that are placed in the qvevri to make wine, but also the name of Georgian grappa. This is because they use the left over “chacha” from the qvevri to distill and make the high alcohol drink called chacha. It is produced in many flavors, including some with fruit and flowers. After lunch, we boarded our vans and drove to KharebaWinery. On the way, we stopped to look at several vineyards, and also encountered a flock of sheep. Arriving at Khareba we were welcomed by a group of polyphonic singers, and were invited to cook food over an open fire. We also had a great tasting and an amazing supra (see this post for details). We arrived back at Hotel Mere around 11pm, and I spent the next hour packing before jumping into bed for a couple hours sleep. My bedside phone rang at 1:30am so I would have enough time to dress, drag my bags down three flights of stairs, and stumbled into the van. We then drove two hours over the windy mountain roads back to Tbilisi, arriving at the airport around 4am. As predicted the airport was swarming with people. All of the restaurants and shops were open, and I had time to do some last minute shopping and get rid of my GEL currency. The flight home was fine, because I was able to fly business class on Turkish Airlines, which is as delightful as Turkish delight candy. The jet lag, however, was not as enjoyable, as I had to go to work immediately when I returned home, and it took me 10 days to fully recover from the 12 hour time difference. It also took about the same time to lose the 3 pounds I gained in Georgia from eating all of their delicious food. A trip of a lifetime, and I want to go back! 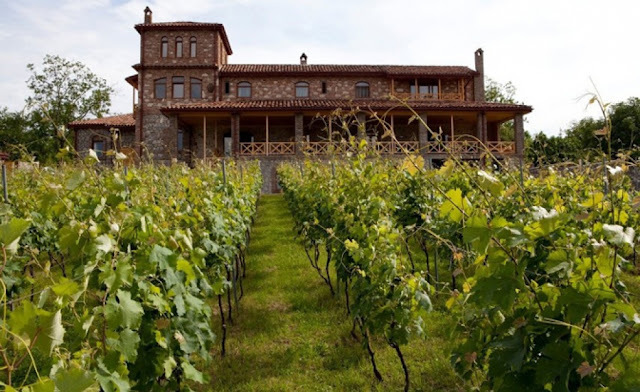 (March 2016) After about a 50 minute drive from the Kartli wine region, we arrived back in Tbilisi to visit the famous Bagrationi Cellars, known for their sparkling wine production. Established in 1882 by Georgian Prince Ivane Bagrationi-Mukhraneli, today they produce around 2 million bottles of sparkling wine made in the traditional method of secondary fermentation in bottle. In addition, they also produce 1.5 million bottles of Charmant. During the Soviet era, the winery was taken over as a Soviet project and produced millions of cases of sparkling. Indeed the winery cellars are massive, with many empty tanks and sections. After the collapse of the Soviet Union, the winery was languished for a while until acquired in 2006. Now they are trying to bring it back to its previous glory. After entering the impressive lobby, which looked like a palace, and climbing the curving horse-shoe shaped stairway lit by chandeliers, we were each handed a glass of sparkling wine when we reached the top. The CEO welcomed us, speaking through interpreters. He guided us through a tasting of four sparkling wines made with traditional varietals, and reasonably priced at below $10US. My favorite was the 2013 Bagrationi Rose Brut, made from the red Georgian grape called Tavkveri (the hammerhead grape). Made in the traditional method, it had a soft berry nose, a creamy palate with delicate mousse, and a crisp acid and refreshing finish. After the tasting, we were escorted on a tour of the massive cellar, with so many empty tanks and rooms. It was a little bit depressing, and also startling to see how huge it had been as an operation under Soviet rule. The last room we visited was where they still have two old women who do hand-riddling – several thousand bottles per day. For the rest of the production, they use gyro-palates for riddling, with an average of 19 months again in bottle and one month riddling before disgorge. The charmat wines are, of course, made in tank. When I asked about wine tourists, they said they only receive around 2000 visitors per year. After the tour, we sat down to the largest supra dinner we had encountered yet. It was truly a grand affair with multiple courses, including several small “complete” roasted pigs. 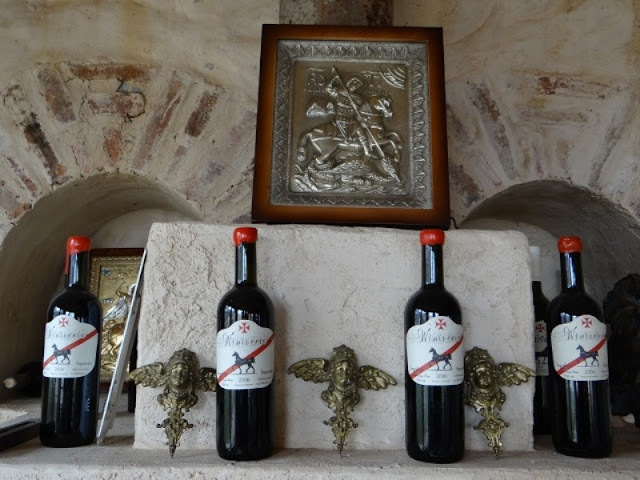 Numerous bottles of exquisite, unusual, and expensive wines decorated the table, including what I was told was Stalin’s favorite, called Khvanchkara, a slightly sweet red from the Racha region. A truly amazing dinner that I’m sure added at least two pounds to all of us. (March 2016) Before visiting Georgia, I had only heard the word “qvevri,” but had never actually seen one, except in photos. Though may people mix them up with amphorae, they are different. A qvevri is used to ferment and age wine, and is buried in the ground. An amphora is used to transport wine and is not buried in the ground. At each winery we visited, the winemakers described the process they used to make wine in qvevri. I documented these processes, and discovered that, in general, there are two main methods: the ancient traditional method and the modern method. The most important issue for success in both methods is ‘physiologically ripe grapes with ripe stems.” Since the wine macerates on skins, stems, and seeds for such a long time, it is critically important to have healthy ripe grapes – otherwise, the resulting wine is bitter and tannic. 2) Transport to winery and place whole clusters with stems in satsnakheli, and stomp by foot. 3) Put juice and all of chacha (stems, seeds, skins – which are referred to as the “mother”) into a qvevri. 4) Leave 15 to 20% space in the top for primary and secondary fermentation. Do not add yeast or anything else. The whole process is natural. CO2 protects. 5) At end of ML, top up with topping wine and close qvevri with a clay lid. Then heap dirt on top of it, and sign of cross if religious. 6) Leave wine in qvevri for around 5 months for white grapes and 1 month for red grapes. 7) When done*, gently transfer wine to clean qvevri for aging, using a small dipper on a long rod. Do NOT disturb chacha in the bottom of the fermenting qvevri. The wine naturally filters itself, and all of the seeds, skins, and stems fall to the bottom. 8) Sometimes the wine will still be a little sweet. This is OK, because that is what nature intended for the year. 9) Optional: sometimes add 26-27 ppm sulfur (which is natural) after ML. Red wine grapes, on the other hand, are much more tannic; therefore, it is only kept in the qvevri with the “mother chacha” (skins, seeds, stems) for one month. If it is kept longer, then is loses its beautiful ruby color and becomes too tannic. 1) Pick ripe healthy grapes in vineyard. 2) Destem and slightly crush grapes. Add a small amount of So2. 4) Put small amount of skins in bottom of qvevri, and then add the clear juice on top. 5) Ferment with natural yeast and allow to go through natural malolactic fermentation. Cover with clay lid. 6) Check on wine occasionally to see how it is progressing. Take samples and measure. 7) After ML, slowly rack clear wine off the top and transfer to clean qvevri, top up, add a little So2 if needed. Cover with clay lid. 8) Age for 6 months. NOTE: The modern process for making red wine in qvevri is similar, but the wine is only left on chacha for one month. In actuality, red wine making in Georgia is not that different from red wine making in other regions of the world, because the wine is usually always fermented on the skins. The difference is the use of a qvevri for a fermentation vessel, and the addition of stems and seeds sometimes. We were also told that the qvevri winemaking process is determined by the region. In the Eastern portion of Georgia where it is warmer, it is called the Kakheti process and uses 100% of the chacha. In the Western region of Georgia, where it is cooler and the grapes are not as ripe, they only use about 20% of skins and no stems. This is often referred to as the Imerti Process. We were very interested in learning how to clean the qvevri, because they are buried in the ground and it is not possible to move them to clean. Though they are lined with beeswax when made (see video on how to make qvevri below), it would still be very difficult to clean them without using a modern pump. Again, we were told there are two methods: the ancient and the modern. Ancient Method to Clean Qvevri – add herbs and hot water, then use a cherry bark brush to scrub sides and bottom of qvevri. Dip out water and repeat process until completely clean. To insure cleanliness, it is customary for the person who is cleaning the qvevri to drink the final portion of water. This is quality control to the extreme! Modern Method to Clean Qvevri - Use citric acid or a lime solution with water. Pump out, and then repeat until clean. Leave top open to air out and dry.